Hi my name is Anna and am a single parent. My son is 23 years of age and we live with my mother as she is on her own and had some health issues. I am very domesticated. 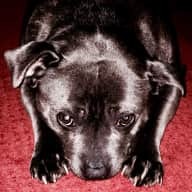 Love animals, we have an English Staffy, Prince, he is like part of the family. I work full time in admin. and do some part time work cooking for an elderly person. I am quite fit and enjoy outdoors. I would like to house sit because firstly, I love animals, especially dogs, and there are time I just want to be a on my own away from all the family hustle and bustle. I have not really had much experience in house sitting. I did house sit for a friend many years ago which went quite well. I am tidy, clean and enjoy the general maintaining of a home. Most importantly, I love animals, love taking the dog out for a walk. I have had the pleasure of Anna caring for my house & pet dog twice. On both occasions I found Anna to be extremely responsible, reliable, punctual & trustworthy. Anna shows a genuine love for animals & instantly bonded with my dog DeeDee. It is a pleasure to have Anna stay in my home & leave with no hesitation my home & my dog will be very well taken care of & I will return home to just the way I like it which is just the way I left it. I highly recommend Anna for your Housitter position.